Lie, Steal, Cheat, and SURVIVE! After playing modern as my primary format, eventually the commander peasantry annoyed me to the point that I stooped to their level. After observing how flooded Commander is with boardwipes, I wanted assemble a creature-based strategy that could overcome the board being wiped every other turn. Marchesa, the Black Rose does that while walking a delicate line between playing an aggro deck and assembling a value engine. We all know how ridiculous sac-outlets are in commander. They protect creatures from being exiled and take away much of the value garnered by the format's all-too prevalent boardwipes. Marchesa then recurs these sacrifices, completely nullifying the price of losing a creature. In a multi-faceted symbiosis, sac outlets also fuel cards like Blood Artist or Midnight Reaver. Land-outlets do not cost any card slots (unless they're Diamond Valley ) which makes them an auto-include. While this deck revolves primarily around death, these get their giggles from watching OTHER things die. Some simply function as repeatable boardwipes, like Dictate of Erebos or Grave Pact, while others are powerful enough to win the game on the spot. Our strongest sources of card draw in various shapes and sizes. They all do essentially the same thing, although Dark Prophecy and Smothering Abomination draw cards even if the dying creatures are tokens. Who doesn't like Fling ? Turning creatures into indirect damage is a Johnny's dream, and this deck's primary win condition. It's the primary reason why pillowfort decks aren't the biggest headache, and how you can hold the board hostage in most games. I regularly use the threat of flinging my entire board at a player who looks at me funny to disincentivize them from poking the bear. 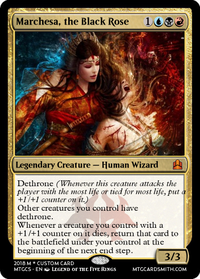 As a final perk, the three Blood Artist effects allow the deck to meticulously manage its life total to consistently aim at dethrone. Other death triggers even combo off with each other to devastating effect. Demon of Dark Schemes is the deck's repeated answer to tokens. It can also dig out creatures that Marchesa failed to protect or cherry-pick from our opponents' graveyards. Similar to Selesnya decks and their addiction to Aura Shards, Dictate of Erebos and Grave Pact lock other creature decks completely out of the game. While that goes down, Black Market (Or Sneak Attack) becomes a five-mana Omniscience so you can cast all the cards you drew with Skullclamp. Pawn of Ulamog acts as the cheapest possible option to provide death triggers. These are the cards that the entirety of the deck is built around. Most of these are sufficient without the use of Marchesa's abilities, and can die without the aid of sac outlets. These are the swingers of value and card advantage. Stacking up two Burnished Hart or Impaler Shrike triggers in as many turns swings the game heavily in your favor. Noosegraf Mob can be combined with a sac outlet (to sacrifice it before the last counter is removed) to amass a legion of zombies, punishing over-committal or spell-heavy decks. Hanweir Garrison fuels the sac outlets, but those tokens can also take over the game as dethrone continuously anthems the team. Patron of the Vein, Plaguecrafter, and Nevermaker are repeatable answers to the likes of Blazing Archon or Ghostly Prison . Hostage Taker is an answer to creatures, yes, but is also capable of stealing opposing Gilded Lotus es or Sol Ring s. Vindictive Lich generates an immense amount of value while enabling us to manipulate life totals for dethrone or even out the playing field against control decks. Undying creatures become invincible with Marchesa on the board. They can be sacrificed twice per turn for a continued albeit slow loop. Reef Worm gives us the choice between continually calling 9/9 Krakens up from the deep or relishing FOUR death triggers per turn cycle from ONE card. Mikaeus and Metalic Mimic then become a engines for producing death triggers every turn rather than turn cycle. Metallic Mimic looks a bit strange, as there is no cohesive creature type for Mimic to buff (Vampire, Human, or Zombie are all surprisingly safe blind picks). The tech with it is that it can be reset through recursion to act as the enabler for our best death proc (have Reef Worm? name "Worm" ect). Similar to Olivia, it also protects Marchesa at her most vulnerable, when she is cast. Chasm Skulker, with proper sequencing, can be sacrificed once per turn if you have a Dark Prophecy effect and a creature that enters with a counter. Mind control, being the staple of the Grixis shard and Bolas' defining ability, has perfect synergy with this general. Act of Treason effects take advantage defining "flaw" in one of Marchesa's abilities. Her ability to return creatures applies to creatures you control, not own. If a counter can be placed onto a stolen creature and it's sacrificed, it'll return to your control at the end of turn, permanently. Of particular note is Cytoplast Manipulator, which is one of my all-time favorite cards in the deck. You can sacrifice it every turn, protect Marchesa or your other creatures, or steal your opponents'. It doesn't do a little bit of everything; it does a LOT of everything. Love it. Building a deck so dependent upon dethrone means that any gap in functionality for the mechanic ends up being a defining flaw of the deck itself. This section covers a few of those larger flaws and how it attempts to account for them. The first is that creatures need to attack in order to receive their protection. Haste enablers are a common fallback for newer Marchesa players, with Urabrask the Hidden or Ogre Piledriver giving a quick boost but failing to protect creatures when they reenter from being sacrificed. Cards that put counters on creatures, so Metalic Mimic, Mikaeus, Olivia, and Unspeakable Symbol, get a value engine rolling while simultaneously standing watch over our boardstate. The caveat that we can never be at the highest life total may seem like a restriction, but it frees us to use cards like Arguel's Blood Fast or Bloodtracker with reckless abandon. Bloodtracker in particular runs rampant in this deck, acting as a gigantic beater that refills our hand when finally answered. It's so good that it replaced Thraximundar . Finally, Herald of Secret Streams, Necropolis Regent and Drana put counters on our creatures to account for when dethrone is shut off or unwise to chase. Boardwipes are a commander staple. With the Black Rose at the helm, these symmetrical board clears are no longer that. They hit your opponents' creatures, while yours are protected under their +1/+1 counter umbrella. Toxic Deluge gets us back in Dethrone range and Chaos Warp is one of Grixis' few versatile answers to enchantments. Due to the deck's ability to gain so much value off of a single card, there is little need for gigantic bombs. Sure, there are some expensive threats, but for the most part six mana is our sweetspot. By the time we reach that, our board state will start generating advantages without the need to be running the Nicol Bolas-type bombs. Talismans in particular are great for turning on dethrone. These are the biggest bombs we have, and WILL end the game if they resolve. Mob Rule and Insurrection, with a sac outlet, are nothing less than a Mind Control board wipe. Every creature is now ours permanently. We can fling them, loop them, or swing with them at will. Death Cloud and Jokulhaups, with Marchesa on the board, wipe every land, hand, creature, and/or artifact, removing almost any chance of interaction when our creatures survive the apocalypse. I've never been the biggest fan of this format's politics. They artificially stall games and stifle many decks' potential. The format becomes slow by design rather than necessity. My deck abuses this by adopting four different "modes" of play, as the title would suggest (it's not just a clever nod to RWBY). I survive by playing aggressive in the early game and nailing down threats, protecting them with Marchesa's counters. By doing so, I'm lying to everyone at the table by appearing as if I'm just playing a fair aggro deck. Slowly, my creatures are outscaled, and the aggro strategy is dampened by blockers. Now that getting dethrone is not probable due to life totals or the enemy board state, I transition into cheat mode. Using sac outlets and death triggers, the deck suddenly shifts towards comboing off to dismantle my enemy's board position. By accruing card advantage through repeatable loops, I make it clear that I am no longer following a fair strategy. As the game shifts back into my favor, mind control spells steal the last semblance of resistance. I close out games by utilizing all of the tools in my deck for a decisive finish. This deck is a lot of things, but control is not one of them. That's where Queen Marchesa comes in. If you want to know what it feels like to play as the player with the highest life total, the one everyone is trying to dethrone, then wonder no more. It's not just control; it's Mardu STAX! Vindictive Lich is good, but oftentimes it doesn't survive the turn cycle and the single proc is all I get. Besides, Priest of Forgotten Gods does everything that Vindictive Lich does to ALL players! Hanweir Garrison is in its place! More creatures means more sacrifice and more fun! Plageucrafter is in the same boat and was replaced by Krenko, Tin Street Boss for the same reason. Vampiric Rites has been...bad...since I made the deck. I was blinded by its manacost, but the fact of the matter is that Phyrexian Altar is just better. Lie, 13;Steal, 13;Cheat, 13;and 13;SURVIVE!